IEC 60335-2-86:2018 RLV contains both the official IEC International Standard and its Redline version. The Redline version is not an official document, it is available in English only and provides you with a quick and easy way to compare all the changes between the official IEC Standard and its previous edition. 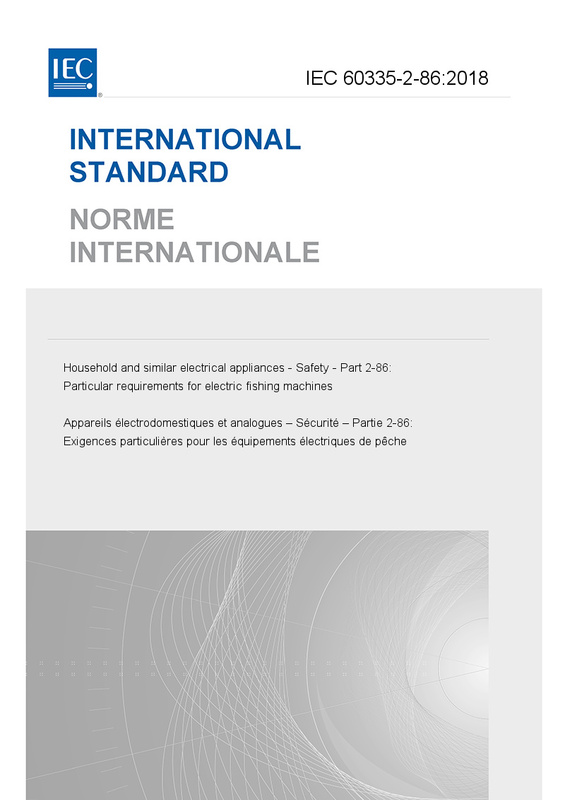 IEC 60335-2-86:2018 deals with the safety of electric fishing machines by means of which water may be electrified for the purpose of catching fish or for providing barriers to all animals living in water. The rated voltage of electric fishing machines is not more than 250 V for single phase machines and 480 V for other machines, except that the rated voltage of electric fishing machines for permanent connection to fixed wiring is not more than 1 000 V. Electric fishing machines are appliances for scientific and commercial use. Additional requirements for boat mounted electric fishing machines are given in Annex AA. This Part 2 is to be used in conjunction with the latest edition of IEC 60335-1 and its amendments. It was established on the basis of the fifth edition (2010) of that standard. This third edition cancels and replaces the second edition published in 2002, its Amendment 1 (2005) and its Amendment 2 (2012). This edition constitutes a technical revision. This edition includes the following significant technical changes with respect to the previous edition: - aligns the text with IEC 60335-1, Ed 5, and its Amendments 1 and 2; - some notes have been converted to normative text (22.102, 22.113, 26.106); - requirements for battery-operated electric fishing machines have been moved to Annex S.